Nature is the Teacher at Burlington's Popular Crow's Path | Features | Kids VT - small people, big ideas! 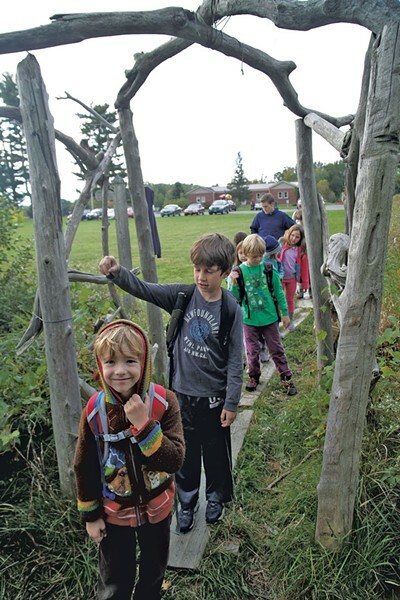 To get to school on Wednesday mornings, Amelia Van Driesche of Burlington must first pass through a rustic driftwood arch she and her classmates call "the portal." It isn't a typical entryway, or a typical school. Beyond the portal is a 144-acre classroom, consisting of meadows, orchards, woods and shoreline stretching to the promontory of Lone Rock Point overlooking the vast expanse of Lake Champlain. For one day each week, Amelia and her classmates at the Crow's Path field school ditch their regular classrooms and roam outside for six hours straight. They make fires with flint and carve spoons using real knives. They track skunks and learn to recognize the hoot of the barred owl. The technical term for what they are doing is experiential learning. Ask the children what they like about it, and they'll say the simple pleasure of being outside. All day. Even in February. The best thing about Crow's Path, says 9-year-old Amelia, is that "we're allergic to going inside." In an age when many schools are flooded with technology, and knowledge is often measured by standardized tests, Crow's Path takes a different tack, more in line with the "unschooling" movement: It gives kids time and freedom to follow their curiosity in the great outdoors. There are no computers, no tests. One of the biggest curricular goals is fortitude — learning, for example, that if you roll in the snow and get wet, you will be cold for the rest of the day, unless you stand by the fire and let the moisture steam off. In Vermont, this kind of learning is in demand, in Burlington and beyond (see sidebar, "Flocking Outdoors"). Despite Crow's Path's lack of advertising, the five-year-old, privately run, nonprofit program is remarkably popular. Through word of mouth, it's grown from five to 75 children, most of them elementary-school kids enrolled in a one-day-a-week field school class during the academic year. An after-school program for 25 middle schoolers runs a few days a month. Both initiatives include a few overnights in the woods. Some field-school students are homeschooled, but most attend public school. Their parents have received permission from teachers and principals to substitute a day in the woods for a day of classroom instruction. The families pay $1,725 for the year and sometimes jockey to do so: This year's waitlist is 45 children long. These parents don't seem worried about kids missing academics. Amelia's dad, Jason Van Driesche, says Crow's Path has made his daughter, a third grader at the Integrated Arts Academy in Burlington, a better student. He points out that learning-by-doing resonates with young children. At Crow's Path, they're learning natural science in a way "that is going to stick and is going to give them a much deeper and more appreciative sense of how the natural world works than if they were simply studying it in the classroom," he says. And, he adds, "the mentoring at Crow's Path is just exceptional. The people who lead it are so good with kids, and they give Amelia and all the other kids there a home base, a place of solidity that I think makes everything else go better." Crow's Path founder and director Teage O'Connor, 32, is playful and unpretentious. He shows up for field school on a recent Wednesday morning wearing clothes that look like they came from Goodwill. Before heading into the woods, he adds a necktie fashioned from grass and twigs and a pine-needle crown. He resembles a grown-up wood sprite. O'Connor's appearance is deceiving. The Burlington resident, who grew up in Alaska and Southern California, is an overachiever. He has a degree in environmental studies from the University of Chicago and a master's from the field naturalist program at the University of Vermont. O'Connor is both competitive — a semi-professional runner, he placed 10th in the 2015 Vermont City Marathon and 42nd out of 45,000 runners at the Chicago Marathon in October — and creative. He starred in his sister Meryl O'Connor's short film "The Ballad of Finn + Yeti," which was shown at the 2012 Cannes Film Festival. O'Connor believes Crow's Path is popular because families want to give their children an opportunity to soak up nature and "explore their wild self," he says. To do that, the kids first have to separate from their daily lives. Before they pass through the portal, they spend 15 minutes running around in a field "to shake off the dust" and get away from the "hustle and bustle," O'Connor says. After that, instructor Julie Pacholik gives each of the children a challenge for the day — telling one to do a sketch, another to make up names for plants he doesn't know. To a little boy who has goldenrod seeds stuck in his hair, she says: "You are actively seeding the forest ... I want you to shake your head off. Disperse the seeds as you walk." After a five-minute hike, they arrive at their camp. Crow's Path operates on the Champlain peninsula known as Rock Point, which is owned by the Episcopal Diocese of Vermont. Though it's not affiliated with the diocese, Crow's Path makes donations to it every year and helps maintain the land, planting new apple trees, fixing foot bridges and maintaining the popular network of trails that wind through the property. One of these leads to the program's primitive headquarters — a fire pit surrounded by logs where children can sit, with a tarp overhead. After making a fire using bark and kindling and a little friction, the children sing a song about wanting to be "free like a flower and a bee." Then they choose a guild, or activity, that will take them through much of the day. Options include carving wood, making apple cider, taking a "walkabout" or doing a "changing consciousness" exercise that involves making a maze in a field. That idea is borrowed from ancient monks. All Crow's Path staff members have wilderness first-aid training and many have worked in other outdoor-education programs. The student-teacher ratio is about five to one, which allows teachers to watch carefully when children are learning skills such as carving. O'Connor initially wondered if he could teach kids to use knives and hatchets without mishaps. "I was really hesitant at first," he admits. Predictably, the children loved the element of danger. Less predictably, they took the safety tips seriously, which O'Connor encouraged by telling them: "I trust you to be careful with this." So far there have been no major injuries, or even minor ones, at Crow's Path, according to O'Connor. Jeffrey Hughes, director of the field naturalist program at UVM, is O'Connor's friend and former academic adviser. Hughes suggests that Crow's Path offers the right balance of freedom and guidance. Kids are encouraged to explore and figure things out on their own, but they aren't "just running around like crazy chopping off one another's fingers with an axe," he says. Hughes adds, "These days, especially among a lot of the very well-intentioned but maybe over-privileged families, there's this controlled, protected environment. We shield our kids from things. As a parent myself, I understand wanting to do that. But, gee whiz, it's OK to get dirty, it's OK to build a fire, it's OK to get poison ivy or stung by a bee." Back at the fire pit, the children run off with instructors into the woods. Pacholik leads the walkabout with three girls in second and third grade who want to explore the property. They start on a shady wood path that runs by a ropes course with wires and swings. Each of them takes a turn swinging over a shallow ravine, shrieking with the thrill. They see an earthen tunnel and discuss: Should they venture in? It's dark and tight inside, Pacholik explains. Ultimately the girls decide to pass up this adventure and move on toward an opening in the forest, after Pacholik announces, "New land awaits us." They walk into a meadow filled with goldenrod gently waving its drying, amber tops. In other spots, long grass forms a soft bedding over the ground, and tall pines stand sentry. Crickets make the wistful song of fall. The girls move slowly, stopping when they want. They tap the poppers off jewelweed and tromp by soft purple wild aster. They grab pods of drying milkweed and pull out the white fluff, blowing it into the air. They hunker down next to a monarch in the brush and watch it slowly open and close its wings. The leisurely walk brings the complex details of an ordinary meadow into focus, intensifying its dazzling beauty. With Pacholik, the children discuss the life cycle of the monarch, the way poison ivy looks in the fall, the fungus on a tree and the reason for a depression in the grass. "It looks like an animal could have slept here," says Zoe Smith, a Burlington 7-year-old who attends Champlain Elementary School. At Crow's Path, Zoe has learned to knit, braid natural fibers, make a fire and carve. "I love it," she says. "I like being outside all day." Ruby Dutcher, also a Champlain Elementary 7-year-old, ticks off her new skills. "I'm learning how to climb, and I'm learning how to find good places with clay. And I'm learning to recognize poison ivy, and I'm learning new animals," she explains. The goal is for children to learn to distinguish the features of the natural world. Making things from wood and rock, calling out the names of trees and flowers that serve as landmarks, reading animal tracks, and turning sumac berries into "sumac-ade" are examples of the nature-based learning the program offers. "There's never any agenda," O'Connor says, but kids gain knowledge. "They will sort of pick up on it over time." Local public schools seem to be OK with that approach. At Edmunds Elementary School in Burlington, 11 students are participating in Crow's Path this year. "This is an individual parent's choice, of course," says principal Michelle Mathias. Under the Common Core national standards, academic demands are increasing, so "parents really have to monitor how their kids are doing in terms of missing whatever academic activities are happening." But, she adds about Crow's Path, "I think it's a great program." Mathias has talked to O'Connor about bringing the Crow's Path experience to all kids at Edmunds, but for now he doesn't see a way to make that possible. It tugs at Mathias to see that only some children get the chance to participate. "It's a little sad for me," she says. "I think enrichment is great for everybody." Back at Crow's Path in Burlington, young Ruby sums up the experience succinctly. As she puts it: "It's nice to get away from school and get outside." Teage O'Connor's own childhood and education helped form the philosophy that guides Crow's Path. Born in Alaska, he spent his earliest years toddling the woods. His dad was a vet, and the family always had a menagerie of animals. When O'Connor was 5, his mom won a prize in a screenwriting contest. The family moved to southern California so she could explore a film career. When young O'Connor wasn't riding his bike or playing outside, he dabbled in child acting. He did a few commercials and still ads and was promoted from bit player to Arnold Schwarzenegger's son in the movie Kindergarten Cop. "I spent a day with him and this actress who played his wife," O'Connor says. Ultimately, director Ivan Reitman decided the storyline with the son made the movie too long. "It wound up being cut," says O'Connor, who got snapshots with the hulking Schwarzenegger but no screen time. When O'Connor was 8, his father died of cancer, leaving his mother to raise him and his sister. He chafed under the rules and ideals at his well-regarded public school. "I was really frustrated with being told what was important and what I had to learn to be successful." The school system failed friends of his "in terms of developing their own interests," O'Connor says now. For all the frustrations, O'Connor was a good enough student to be admitted to the selective University of Chicago. He studied photography, statistics, computer science and many other things on the way to earning a degree in environmental studies. He moved to Burlington in 2008 to get a master's degree in the field naturalist program at the University of Vermont. O'Connor started Crow's Path by offering a short summer session. Now, in addition to directing the program, he teaches natural history and botany at the University of Vermont and Community College of Vermont. When he's not teaching, he's often running, sometimes barefoot, through Burlington; he logs 100 miles a week. O'Connor, who is engaged to be married, has no children of his own yet. O'Connor's personality is part of what has made Crow's Path successful, says Jeffrey Hughes, director of the field naturalist program at UVM. "He's a world-class runner and so [he has] to be pretty competitive," Hughes says. But O'Connor is competitive with himself. With others, he's a community builder, his friend says. At Crow's Path, "he's a terrific cheerleader for all these kids." Crow's Path is not the only one-day-a-week field school in the area. 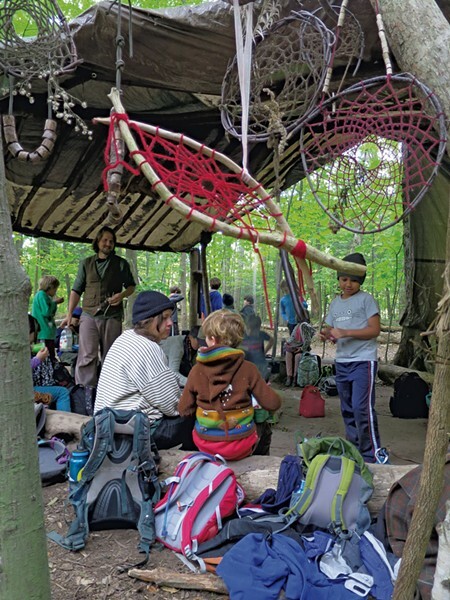 The Forest School in Richmond uses a similar model. So does the EarthWalk Village School in Plainfield, and the Roots School in Corinth and Marshfield. Some private schools, such as those in the Waldorf network, emphasize nature and hands-on skills like carving. So do some homeschooling parents who are inspired by the growing stack of books touting the benefits of outdoor learning. These titles include the recent Home Grown: Adventures in Parenting off the Beaten Path, Unschooling and Reconnecting with the Natural World by Cabot author Ben Hewitt. Meanwhile many public schools, including Edmunds Elementary in Burlington, offer field trips that bring kids into nature. And a few public schools are going further. 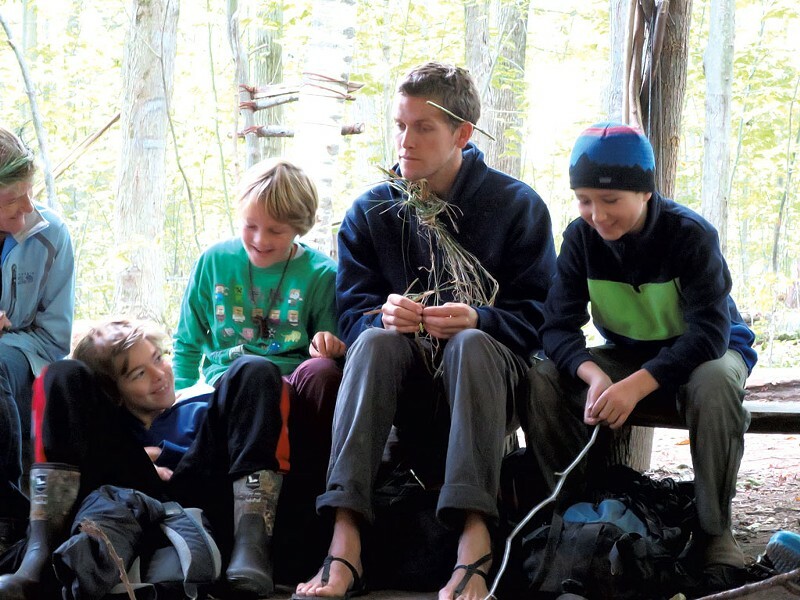 This year, Shelburne Community School kindergarten teacher Joplin James is spending every Friday outside with his class in a patch of woods near the school. The Forest Fridays program will continue through the winter, just as Crow's Path does, and he's already working with families to make sure children will be dressed appropriately. "I definitely believe there's no such thing as bad weather; there's just the wrong clothes," James says. So far parents are keen on the pilot program, even though James sees it as somewhat "radical." The only complaint from parents is that it's not available to more children, he says. "Kids just don't have the play time outside like we used to."